The first few weeks have been a tangled mess of nightmares so twisted with reality that I can no longer discern the difference. I try to carry on like nothing has changed. Each morning I slide reluctantly from the warm embrace of my bed and force myself to dress. Sometimes I even remember to eat. I organize the never-ending supply of casserole dishes and baked goods left surreptitiously on our front step by well-meaning neighbors and friends. I sweep floors that don't really need sweeping. I fold the piles of laundry that grow endlessly despite not being able to recall ever changing my clothes. The television, my constant companion since my husband returned to work, murmurs quietly in the background. I plod through the days in a stupor. Then, one sunny afternoon, I find myself standing in the open door of Anna's bedroom. For weeks I have passed by this room, which was once a new mother's dream with its buttery vanilla woodwork and sumptuous pastel bedding and drapery. Turning my head away, I would try to ignore the silence that echoes through the open door. I take a hesitant step, then another, and suddenly I am stumbling across the threshold. I find myself at the foot of the ridiculously expensive crib I had convinced my husband we absolutely needed to have. Tiny plaid rabbits cavort across the velvet of Anna's favorite blanket. It lies carelessly tossed over the flannel-covered mattress. My mom had brought the blanket to the hospital on the day of Anna's birth, a gift for her first grandchild. Anna had slept with the blanket every night since, with the silken folds covering her tiny, sleeper-clad body. Later, as she grew, she grasped the satin border tight in her chubby fist and tucked it up against her silken cheek, one that rivaled the softness of the blanket's plush surface. 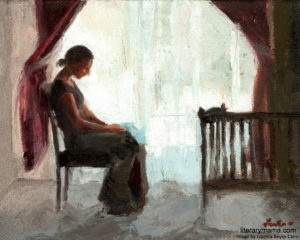 Leaning over the empty crib, I stroke against the fabric's nap, feeling the soft fibers stand up firm against my touch. A warm drop of moisture falls and lands on my wrist. Another follows, and still more, until a torrent of heartbreak finally finds release. I press the blanket against my face, inhaling the sweet perfume of baby powder and sour milk. I drop to my knees, clutching it against my chest. Time passes. Shadows creep through the bedroom window, elongating and sliding before fading into darkness. Leslie Wibberley loves the written word almost as much as her family. Her creative nonfiction essays can be found in Mamalode, Mothers Always Write, Literary Mama, and The Manifest Station, and her short stories in Devolution Z and Chicken Soup for the Soul. Her work has also won a sixth place and an honorable mention in Writer’s Digest’s Annual Competitions. Lovetta Reyes-Cairo lives in Orem, Utah with her husband and son. She graduated from Brigham Young University in 2009 with a degree in Elementary Education. Much of her work features the human figure and explores ideas of spirituality, healing, balance, beauty, and love.